Sunspots are temporary phenomena on the photosphere of the Sun that appear visibly as dark spots compared to surrounding regions. They are caused by intense magnetic activity, which inhibits convection by an effect comparable to the eddy current brake, forming areas of reduced surface temperature. Like magnets, they also have two poles. Although they are at temperatures of roughly 3000–4500 K (2727–4227 °C), the contrast with the surrounding material at about 5,780 K leaves them clearly visible as dark spots, as the intensity of a heated black body (closely approximated by the photosphere) is a function of temperature to the fourth power. If the sunspot were isolated from the surrounding photosphere it would be brighter than an electric arc. 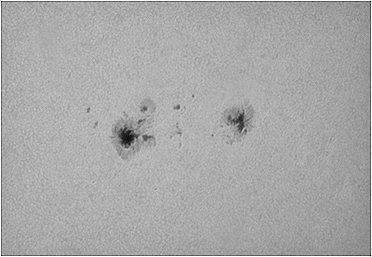 Sunspots expand and contract as they move across the surface of the Sun and can be as large as 80,000 kilometers (50,000 mi) in diameter, making the larger ones visible from Earth without the aid of a telescope. They may also travel at relative speeds (“proper motions”) of a few hundred m/s when they first emerge onto the solar photosphere.